Wood Products Extension at NCSU is currently developing a Wood Waste Recycle & Reuse program. To assess the needs of the wood products industry we would like to ask you some questions. All responses remain anonymous and confidential. CLICK HERE for the survey. WOOD 101 is a one day workshop designed for participants to learn about and explore numerous facets of wood and forest products. This course is designed for those that want to know more about wood : woodworkers, hobbyiests, homeowners, DIY wood folks, consumers, and those that simply want to know more about this versatile material. Come join us in NCSU’s Hodges Wood Products Laboratory on Thursday June 20, 2019. (Pre-registration required). For registration details CLICK HERE. NHLA Hardwood Lumber Grading Workshop at NC State University, Raleigh, NC, June 4- 6, 2019. (contact Phil Mitchell: Phil_Mitchell@ncsu.edu). National Firewood Workshop, Epsom, NH, June 12 and 13, 2019. Contact Harry Watt for information (704) 880-3067 or Harry_Watt@ncsu.edu CLICK HERE for registration and more information. Wood 101, June 20, 2019. Contact Frederik Laleicke (Frederik.Laleicke@ncsu.edu) for more information . CLICK HERE for registration and more information. Alternative Forestry Income Streams for Landowners, Thursday, July 11, 2019, Mills River, NC. Click here for more information. Alternative Forestry Income Streams for Landowners,Tuesday, June 4, 2019, Statesville, NC. Click here for more information. Four Excel Spreadsheets that help explain the Behavior of Wood. Lumber is often air-dried for months prior to being kiln dried. The air-drying yard manager must decide when to stop air-drying and move the lumber to the dry kiln. The Air-Drying Estimator Excel spreadsheet is based on previous air-drying of lumber research. The intent of the Air-Drying Estimator is to help the air-drying yard manager estimate how long to air-dry lumber prior to kiln drying based on species group, U.S. location, the start date, initial moisture content, and the target or ending moisture content. The Air-Drying Estimator will estimate the date the lumber dries to the target moisture content, the number of air-drying days required for the base case and for lumber placed on the yard each month, and displays drying curves. 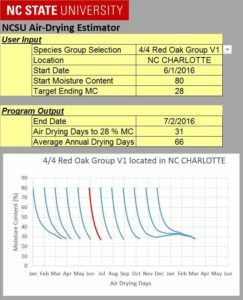 Download the “Air-Drying Estimator.xls” spreadsheet (or email phil_mitchell@ncsu.edu to get the xlsx version). The moisture content of wood in an environment held at the constant conditions of temperature and relative humidity will come to an equilibrium with its surroundings. The air temperature and relative humidity will determine the equilibrium moisture content (EMC) conditions, and the moisture content of wood in that environment will approach the EMC of the air. 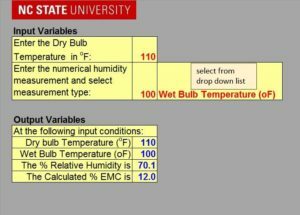 An Excel spreadsheet (titled “EMC Calculate”) is available that will calculate an estimate of the EMC based on the dry-bulb temperature and one of the following: relative humidity; wet-bulb temperature; or, dew-point temperature. Download the EMC Calculate.xls spreadsheet (or email phil_mitchell to get the xlsx version). Wood responds to atmospheric moisture in a predictable manner. If the relative humidity and temperature of the air are known, we can determine the equilibrium moisture content of that air, or EMC. Knowledge of the EMC is useful in estimating how fast lumber on an air drying yard will dry; how long it will take for kiln dried lumber to pick up moisture when stored in a warehouse; and the performance of finished wood products in exterior service. The National Oceanic and Atmospheric Administration publishes 30-year Climate Normals for locations in the United States. 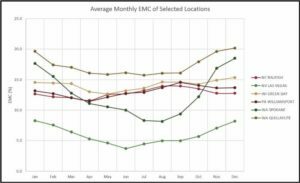 Climate Normals for 1981-2010 were used to determine the average monthly exterior EMC values for 252 locations in the US. Wood shrinkage is often calculated with the assumption that the radial and tangential shrinkage occurs parallel to the lumber surfaces. As a result, the calculated shrinkage has a built-in error in calculating the change in dimension as it ignores the curvilinear nature of the growth rings. 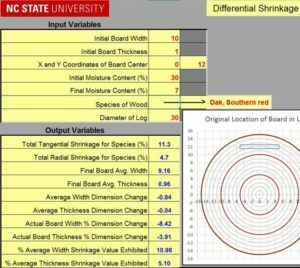 This Excel spreadsheet model considers the curvilinear nature of growth rings to calculate the transverse wood shrinkage and the amount of cup that might develop. The model is dependent on wood species, initial and final moisture contents, and location of the board within the log.